For four hundred years the mission churches of New Mexico have been the source of myth and legend, of fantastical stories of martyrdom, heresy, retribution and reconciliation. Those that are still living places of worship in the Puebloan communities are, along with the kivas and clan houses, very much at the center of the intense spiritual vitality of the villages. The physical presence and ongoing use of the missions attests to the remarkable perseverance of the native communities. Driving into any of the pueblos, one is always taken by the presence of a Roman Catholic mission in a prominent, and usually central, location. Even the most casual of visitors wonders, often out loud, how it came to be that a Christian church so dominates the townscape. Even more thought provoking is the care and respect these buildings are given and the special manner in which they are incorporated into a religious cycle that predated their advent by many hundreds of years. Intangible wonders aside, here we have an assemblage of massive earthen buildings that have survived for centuries through the will and hard work of those to whom they have the most meaning. Over time, they have been destroyed -- most of them during the Pueblo Revolt of 1680 -- have been rebuilt, added on to, and changed in ways ranging from minor additions to major remodels. They have in fact changed so much over the years that a modern preservationist would be driven mad to see it all in stop-action. But change is the first and most important tenet of preservation for vernacular buildings, because only through adaptation can they retain their usefulness. On August 13th at 10:30 in the morning, a re-dedication mass will be said at the St. Augustine mission in Isleta Pueblo. The Archbishop will preside even though he doesn't own this building. (An interesting factoid: the bishop of the Archdiocese of Santa Fe legally owns the churches in his jurisdiction except for those in the pueblos. Those are owned and controlled by the various sovereign groups. The one exception is Ohkay Owingeh -- the former San Juan. 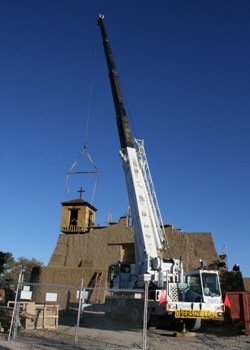 That aside. . . .) The Pueblo of Isleta has just this week finished the restoration of their church. It is a fabulous story of which I can tell only a small part in this space. When we were asked to perform the restoration of the mission, the then Lt. Governor (now Governor) Frank Lujan defined the scope of work thus, paraphrased; "We are used to it the way it looks today. Fix it, but on the day you leave, it must look like it did on the day you began." In other words, no change. Well, in the most substantive way, that is in appearance, we were able to comply. But in the interest of convenience, we added a new staircase to the choir loft, installed heating and air conditioning (you will be amazed at how invisible it is), new lighting and a solid floor. It is the closest I will likely ever come to a perfect restoration project because the visual integrity of the building has not been compromised despite the installation of features that satisfy a 21st century clientele and, perhaps most importantly, the building is now good for another 100 years of use. And it is still all adobe. The resurrection of St. Augustine took 16 months and employed a crew of 31 at its peak �- that is, during the repair of the massive adobe walls. We removed 375 tons of concrete that had been poured around the base and applied as plaster during various campaigns. It required 75,000 new adobes, plus thousands of salvaged adobes to rebuild the failed north wall and the surprise collapse of the interior wythe of the west wall. Several months were spent digging through four hundred years' worth of successive floors and deposits to reach the original base of the walls. In trenches six feet deep we discovered the original basal wall detail, a mud plastered plinth, that gave us the starting point for repairs. Working through the winter we enclosed the entire north end of the building, the sanctuary and apse, with an enormous tent and accelerated the drying of mud mortar with heaters that consumed over 20,000 gallons of propane. Through it all, discoveries were made that added considerably to the Isletans' knowledge of their mission church. 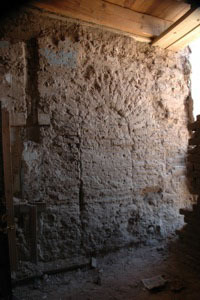 First, we found that the entire interior of the building was covered in murals that had been buried under successive layers of mud plaster and finally a modern (1959) hard plaster wainscot. Amazingly, the murals were on every wall and at every height, floor to ceiling. They were executed in mineral pigments over very thin caliche slip coats. After analysis and much discussion, the Pueblo of Isleta determined that the murals could best and most economically be preserved by covering them with yet another coat of mud. Another remarkable feature of the building is that it is actually two buildings, one encasing the other. We believe that the original mission, dedicated to St. Anthony, was built ca. 1613 and destroyed in 1680. It probably remained a ruin until the early 18th century when it was rebuilt, and probably enlarged, to be re-dedicated to St. Augustine around 1710. It is very clear from what we discovered as we dismantled select areas for restoration, that the original walls -- those now on the outside -- were about 30 inches thick at the base and 20 feet high. Somewhere along the line there was either a failure or the fear of one and an additional wall was built as an interior veneer. The two walls essentially buttressed one another, but were not mechanically connected. When you look at the embedded corbels under the vigas, you will see that some of the detailed carving is either buried in the wall or barely visible. The interior veneer explains why. There is much more to say; this story is not a short one. 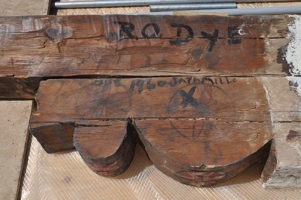 The now-completed restoration of the St. Augustine mission has resulted in the addition of many previously unknown, perhaps even unexpected chapters in the building's history. These are Isleta's for the telling and they will begin relating that remarkable tale on August 13th, 2011.